Learn with Play at Home: Putting our school shoes to the test + 5 sidewalk chalk games that get kids moving. Putting our school shoes to the test + 5 sidewalk chalk games that get kids moving. My little girl is starting school this year! It is only a matter of weeks before she straps up her velcro, slings her gigantic bag over her shoulder and begins her career as a school kid. It's a very exciting and nerve-wraking time, and I'm not just talking about for her. I am busy labelling every single thing that might leave this house, getting together all the lunch box supplies and generally trying to get everything organised so that we're ready to roll on that first day. A very important part, for us, was getting really good school shoes. 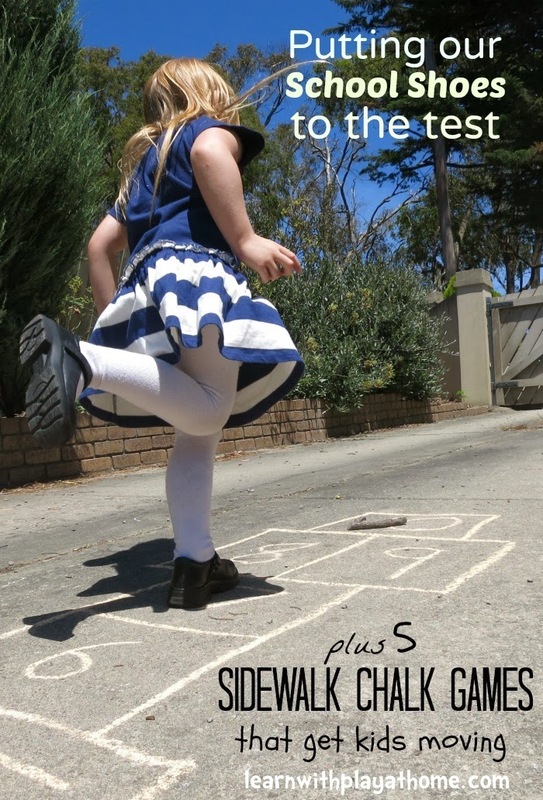 After all, they are in them all the time and as a teacher myself, I've seen how hard kids put their shoes to the test. Whilst the school we've chosen is quite relaxed on the choice of black school shoes or runners, my little girl has been looking forward to her own pair of "proper girl school shoes." I liked the idea of how nice they looked with the school uniform and for more formal occasions like school pics etc. but, I thought about how much running she was bound to be doing each day, so was leaning towards running shoes instead. When we were offered the opportunity to try The Athlete Foot's, Ascent range of school shoes, I jumped at the chance because they seemed to encompass the best of both worlds. Labelled, "Sports Shoes in Disguise" because they're built on Running Shoe Technology and being the only school shoes to be endorsed by the Australasian Podiatry Council (APodC) they sounded like the school shoes for us. I was certainly keen to find out. I'd read of the importance of getting a professional fitting and there's no way I would have had the confidence to fit them myself. The amount of shoes that I've bought Maddie, based on her "shoe size," that have ended up hurting when she walked or not fitting right, is too many to count. I've also been through enough "cheap" shoes to know that for school shoes she was going to be in 5 days a week for hours on end, I was going to have to invest in a "good" pair. I was keen to get her fitted up properly and I was very glad I did. The sizing she ended up with was completely different than what she'd been sized as at the start of Summer. The staff at The Athlete's Foot were really good with her and it was great to see that instead of just measuring the length of her foot, she was also measured for the width and had her balance and how she walked examined. I felt confident we were going to get a good fit. She loved trying on the different shoes in the range and walking around the store testing them out. And she was delighted with her chosen pair! As with most new shoes, she wanted to wear them right away. The weather wasn't great outside so she spent the rest of the day wearing them around the house. The next day was great outside weather and she wanted to dress up like a school girl and go outside and play. The perfect chance to do all the things you can't really do inside a shop, like hopping, skipping, running and jumping. She certainly did them all. 5 Sidewalk Chalk games that get kids moving. One of the things that Maddie requested doing when we were playing in the front yard was for me to draw her a game of Hopscotch. She must have seen it being played on tv or in books by "school kids" so wanted to play it too in her new school shoes. She enjoyed playing it and it was a great way to encourage her to get moving, using only the concrete and some chalk. I decided I should find some more great games using the same materials so that we could mix it up a bit. Here they are. Draw 10 numbered boxes as shown. Single boxes are for hopping on one foot and the double boxes are jumped in with one foot in each. Player throws a stone or stick into the first box. It must land in the box without touching the edges. Player jumps or hops over the box with the stick/stone and hops and jumps up to the top. Player turns on one foot at the top and hop/jumps back the same way until they reach the box before the one with the stick. Player must stop in that box and pick up the stick while still balancing. They then continue to the end. All of the games look like great fun. We can't wait to give them a go. Not only are they great for gross motor but they are all educational too! Shhhh, we won't tell if you don't. Giveaway * Please note this giveaway has now ended. Thanks to the good people at Ascent Shoes, we have 1 pair of Ascent school shoes to giveaway to one of our Australian readers, valued at up to $139.95. Ascent School Shoes are "Sports Shoes in Disguise" and are exclusive to the Athletes Foot. Some models even come with a 6 month outsole warranty which is great if you have a child who wears hard on the soles. You can find out more details about range of Ascent school shoes on the Ascent Footwear 'School Shoe' webpage and the Ascent Footwear Facebook page. How to enter. Answer the following question in the comment section below. What does your back to school routine look like? Do school shoes feature? Please contact us to claim your prize. 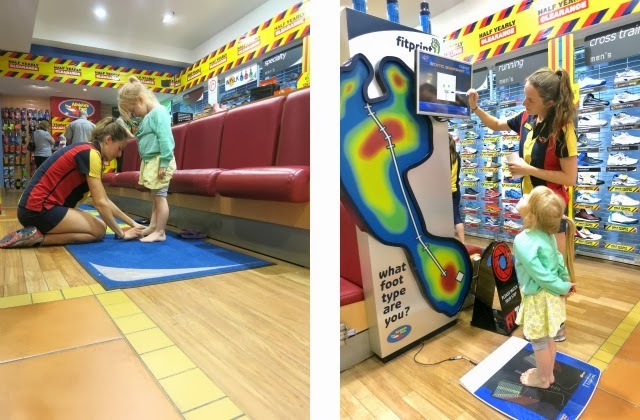 If you win, don't forget to pop into the Athlete's foot for a professional fitting to make sure that you choose the perfect fit and size for your child. We're glad we did. I don't have a school aged child but just wanted to say how great it is you highlighting the importance of fitting shoes correctly for our kids. These shoes look fabulous for kids on the go. Love the outdoor chalk games too. M must be so excited about starting school. She certainly looks like she is loving her new shoes. I have 2 at school, 1 to go, and all have orthotics so the right podiatrist-approved shoes are paramount!! I usually leave the shoes until just before school goes back to allow that summer growth spurt to tail off. Books and covering comes just after Christmas... lunch box ideas... yes please?! With five children aged from 2 to 14, our back to school (kinder and daycare) routine starts the year before! I start by making sure I keep track of all incoming notices from the school about the following year. I use Evernote to do this so that I have them all accessible wherever I am and I can even search within the text of notices to find what I need. From all the notices, uniform lists and books lists, I create a master list of what everyone needs and start shopping for some items in the second half of the year before so that I can get some on sale. However, for items that they can grow out of (like shoes), I usually shop the week before school. I try to just take one or two kids at a time so that I can concentrate on getting the proper fit, rather than being stressed by the other kids getting bored. On the first day, they are loaded up with their new stuff, lunch packed, uniforms and shoes on and then time for a quick "First Day" photo! It's a busy time of year, but it is also wonderful to see the excitement that goes with the start of another school year! This year my last baby is starting school so the routine has been getting his uniform ready and labelled, lunch boxes, drink bottles, backpacks and hats ready, and of course, making sure they all have a good quality decent pair of school shoes that will hopefully last the year. I have been stressing about what shoe to get my son, who starts school this year, yikes! We've never gotten a "good" pair of shoes... but then again, we go barefoot most of the day which will change when he's at school. I'd really love to get some good quality comfortable shoes for him, so thanks for sharing about Ascent, they look great. With my youngest starting school this year, miss 6 starting year 1 and my second eldest her HCS the back to school routine will be essential. Last year I made a mistake and bought $30 leather school shoes in Target for my daughter and I was in shock that by the end of term 1 they were completely worn out with holes on the bottom. I bought her another pair from another store and they are worn in uneven. All my children have 'flat' feet and I will need to make The Athletes Foot part of my back to school routine. I need to get organised with our back to school prep as Miss4 will be starting Kindy and Miss6 going into Year 1 - your blog has prompted me to get prepared! We usually buy the stationary supplies throughout the year when they are on special so we don't need to go rushing out for bits and pieces. My youngest picks a new lunch box each year. I found having him pick it means he's less likely to lose it! For shoes and uniform we usually wait until the week before they go back to school. I've been caught out too many times with my boys who decide that January is the perfect time for a growth spurt! The 1st week of January is review time! Displaying school items to ensure we save EVERY dime! Writing their school list is what they really like! A “school uniform” fashion parade from top to toe! Then mummy (me) has a list, judges and enjoys watching the show! Easy way to decide what does and doesn’t fit! If hats and socks are missing mummy has a FIT! We circle and price to ensure that our “ONE” stop shop motto does not FAIL! Office Works! School Uniform Shop! Shoes and Sox! we cautiously spend! “Organisation” our growing family of seven does depend! We only have 20 mins to get ready in the morning so it's rush rush rush with no time to spare for anything other than toilet, food, teeth, clothes and shoes! Done with military precision every morning! Uniform at the ready, getting him to bed earlier in readiness for the school hours, then crossing all our fingers and toes he will be well enough to go. but I am sure that Ascent CAN DO! Maddie is so cute! Back to school for us means back to preschool - but shoes still count! JJ has a narrow heel, so I'm on the lookout for a new pair of "big girl preschool shoes" that will fit snugly around her heel so she can feel confident playing, climbing, jumping, running and hopping. (She can't quite skip yet, but hopefully we can add that to the list soon too!). My Back to School Routine every year includes a YIPEE! new shoes and water bottles too. School shoes always feature in the back to school routine. They grow out of them so fast but it's important to get a great pair. Other than getting great shoes we also celebrate going back to school by counting down. I think it's important for children to love to love school and so a countdown is a lovely way to do this. One day we'll cover the books as fun craft the next, go through all the lovely classroom books and stationary and then we write goals for the year that she's going into to. School is so much fun! This is the first time for me to be the school mum so it is all new. I also took my daughter to Athletes Foot for her first shoe fitting and I am so glad I did. I am pretty confidant that she loves her new shoes and they will be comfy. Now just to sort out the lunch time gear and school uniform! I try to minimize the expense of back to school costs by giving school bags, stationary and accessories to the kids for Christmas. Clothing and shoes is mainly what I am left to buy when the new year begins. Having a tight budget means I wait for the best sales, scouring catalogues and stores for the best buy. It time consuming and can be quite a headache but it is necessary in order to financially survive. We are homeschoolers so our back to school routine is a little different! However, school shoes are always helpful! I'm no longer in school, but hopefully when I start teaching, it'll be a really exciting time for me! I remember always being so excited as a kid when it was time for back to school. Love the sidewalk chalk games! We have a little one going to big school for the first time so it's all a new routine for us. Shoes are sooo important and I have 'bad' feet myself that I don't want my kids to end up with by spending their childhood in ill-fitting cheap shoes, so we're going for the proper fitted 'good' shoes too. Doing the 'wiggle toe poke check' to see if shoes can last a few months into the new year, and then blowing the budget buying new underwear, stationery and lunchboxes anyway! Okay, it's true, I buy double the stationery and keep a lot for myself! A last minute rush as returning to school always seems to sneak up on me. Comfy, well fitting shoes are a must - for me that is! This is my first year sending my first child to school. So, routine? I do not have, Shoes, umm I also still do not have. I am freaking out because i have 10 days and no shoes, no uniform, holy snapping ducks, what am I going to make him for lunch? Should I be learning to cook quiche? Bed-time routine? Should he have one? Routine. (breathe) Routine... ummm yes , I'm working on one, and ummm... yes, shoes will feature, they will... tell me I'll get through this???? Not much routine in my house but we always get to school on time. my son went through 4 pairs of shoes last year so some good school shoes would be fantastic. "sports shoes in disguise" sounds perfect for my little guy. He loathes wearing shoes so school shoes will be a big adjustment for him. At least with a pair of Ascent shoes he would get something with a perfect fit, they'd be comfortable and he'd actually want to wear them. Our back to school routine is pretty relaxed at the moment! This is my son's first year at school and we have all of the essentials bought, and now it's all about relaxing so he's calm and happy on the big day! Like some of the other ladies here, this is my daughters first year of school! So i haven't tried out the routine yet! I am however organised, that should work in my favour. Our school routine looks and sounds like chaos. I've tried to be organised every year and every year my children foil me. Do school shoes feature? Of course they do! They get lost, every morning, both pairs vanish into thin air only to reappear as we already become late for school! I am still developing my routine as my oldest starts prep this year. So just hoping I get it right and am totally organised for the big day.It's bringing a tear to my eye just thinking about it. But today is book covering day (god please help me remember how it's done!) Lunch box, uniform and shoes are ready to go. I have bought shoes that still have a little room for growth so am just hoping they will be comfortable for my active little boy. my routine starts with the most important shoes and school uniform. Making sure I get in early for the sizes I need before they are all sold out everywhere is a must as I learnt the hard way a few years back when I couldn't find any uniforms in the sizes I needed. followed by all the other school necessities, Bag, lunch box, pencil cases etc. I let the kids help choose with these. I usually have everything sorted 2 weeks before school starts. My back to school preparations began with getting list of requirements from school. I bought Mr 5’s school uniform at the onsite uniform shop, when we visited the school for Kindy orientation. Next to do was buying 2 pairs of school shoes, one for every day and one for sport. 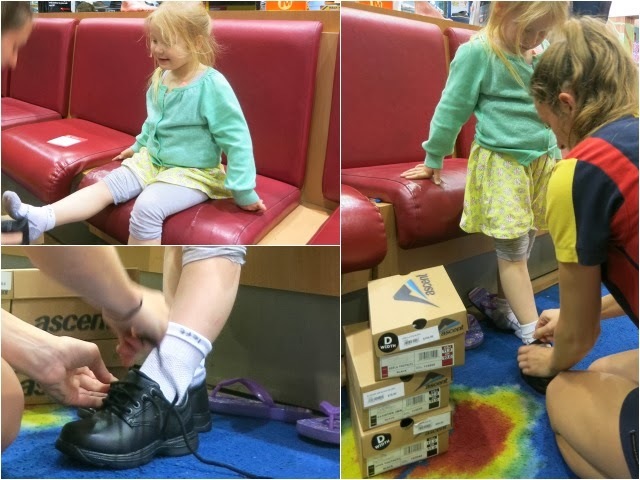 We needed shoes that meet uniform requirements, while being comfortable, easy to put on (Velcro), were supportive (we got a professional fitting to ensure this) and shoes that my son can easily sit down on the floor in and also feel comfortable running around in. I just got him to try the shoes on again to ensure they still fit, kids can grow fast! Over Christmas we bought stationary and a lunch box big enough to fit enough food in. I’m pretty much done labelling school items. I’ve also applied for a day’s leave from work – to be able to drop him and pick him up from school on his first day, and join other parents for ‘tea and tissues’ as our kids begin big school. My back to school routine is to start early and slowly tick off the list the things I need to buy and prepare. Our back to school routine is making the most of every last minute of the holidays and doing lots of family projects and outings together! Back to school is done and dusted! all bar the shoes that is they get left until the week before school starts to ensure a perfect fit and time to be "broken in"
My back to school routine this year consists of getting one child ready for high school (new uniforms, textbook hire, book pack, new school bag) and one child entering Year 4 (book list, one new uniform, new lunch bag). I have opted for slip on covers this year...so easy! Just need to do a big baking/freezing session of school lunchbox treats. School shoes most definitely feature as I always buy the girls new good quality shoes each year. & our kids are going back to school in few days. aim is to OVERPOWER stress ,have THE ADVANTAGE & be WINNERS. Take the ADVANTAGE - of all the back to school sales to be cool. TRY YOUR BEST SHOTS - cook & choose their favourite recipes. PERFECT FITTED SHOES - as feet stay in them for 7 hours. Remember to have photos of the winners on the final day. Through Concrete Resurfacing an old and worn out concrete surfaces can be restored without the use of a new one.